What a great find this is! I started to import records (into New Zealand) from Peter Russell in I think about 1972. In those days to try to prevent people sending NZ money out of the country, we were limited to one 5/- British postal note per day from the local post office. It took quite a few trips to the local post office (I lived in the country) and much poring over 'The Good Noise' to decide what to get. Many of the discs I got in those days I have converted to compact discs and they are still much enjoyed. Ace Of Hearts were pretty cheap and then Coral were even cheaper - 99p. There was never much personal service from Peter-never any comments but good prompt service and oh, the joy of receiving a fresh parcel of records from the UK. Went to Plymouth with parents in early 1960's. Discovered PRHRS and bought 3 albums Slim Harpo -Raining In My Heart, Lightnin' Slim -Rooster Blues, both on Excello and Jimmy Reed - Rockin' With Reed on VJ. Now around forty five years later still got them, still into Blues. Comment: Bob Barton. Martin Freeman Plymouth Herald chats with Pete Russell – the man who filled Plymouth’s homes with music. DECADES before the internet was anything other than a science fiction dream Pete Russell had his own worldwide web, run from Plymouth. He was at the centre of a global music business, supplying records with the help of nothing more hi-tech than the lick-and-stick stamp. His mail order concern, specialising in jazz, ran from a modest office next to Plymouth Pannier Market. 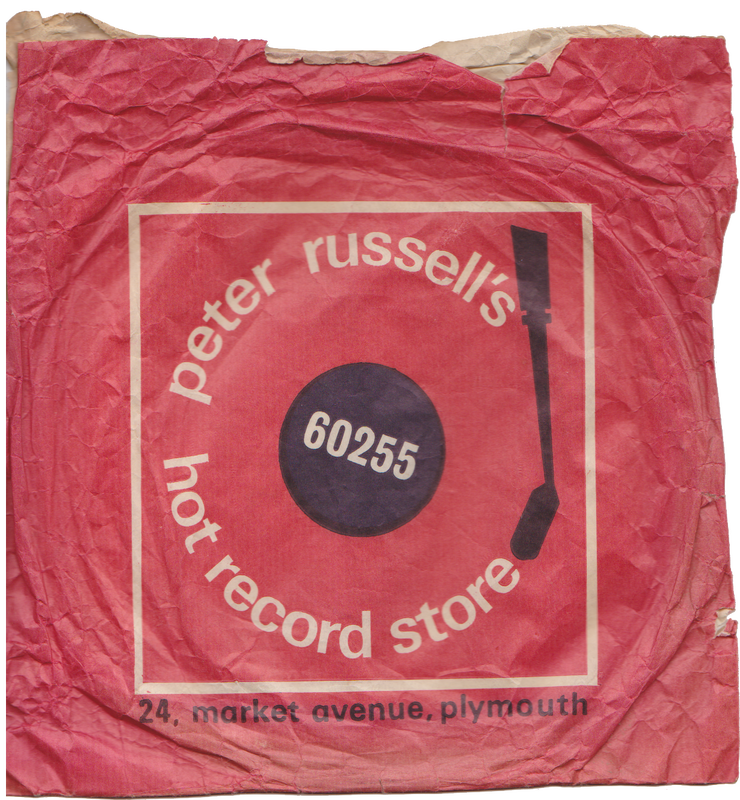 For Plymothians, Pete Russell's Hot Records – in various forms – was the place to satisfy their musical cravings, across the genres and through the trends for nearly four decades from jazz, rock'n'roll, skiffle, beat, rhythm and blues to rock and pop. The shop may be gone but many Plymothians will recall the first or formative records they bought from Pete.Few weighty 78s will still be in use and the old 45 singles, 331/3 LPs and cassette tapes are more likely now to be gathering dust in garages and attics rather than getting a regular spin or a whir on a turntable or deck in the lounge.Anybody under the age of 30 might need to know that those numbers refer to rpm – revolutions per minute – the speed at which the discs were played. Quite a few of those records will have been replaced by CDs, many also bought from Hot Records. Whatever the format, each time a tune is played a memory will return. All thanks to Pete. Not bad for a barefoot boy from the bush: he arrived in the UK at the aged of seven having been born in the back of beyond near Melbourne, Australia. "I couldn't read or write when I arrived in Britain," he says. "I found shoes uncomfortable so I took them off in class. It was a convent school. They were very strict and so I got into an argument. "They made me stand in the corner with a dunce's hat on which I did for a few minutes before I thought, 'I'm not doing this'. "I told the nuns they were a load of pigs and ran off. "That wasn't the greatest of starts in Britain for the youngster. Nor had his parents, Dorothy and Jack had it all easy when they were in Australia. They moved from the UK to Australia in 1921 in the aftermath of World War One – in which Jack had been wounded – hoping to make their fortunes. They didn't. Their peach-growing business was going nowhere in particular and when Pete was born his parents decided they had better return to the UK to get the lad a "proper" education. They upped sticks in 1932. The convent school in Wisbech, Cambridgeshire, not far from where his mum had grown up, was only one of many as Peter's father moved several times trying to find a steady job. His early years have a touch of Roald Dahl about them: the tale of Pete and the Tiny Peach had what all classic children's adventures seem to have, a wealthy benefactor. In Pete's case there were some kindly and well-to-do relatives who paid for him to go to a private reparatory school. There was some misfortune, too: he spent the best part of two years in bed, stricken by the kidney disease, nephritis, when he was aged about ten. His education was still a game of ping-pong as his dad tried to find an enduring career. One spell was in Devon, boarding at a grammar school, Queen Elizabeth, in Crediton. Pete's mum and dad need not have worried about his education. The lad did finish school and, having been rejected by the army in World War Two – he has asthma – he went on to study electrical engineering and had a career in industry. But more significantly, Pete is a firm believer that, school or no, he was already educated by his environment, his genes and his parents before he left Australia. "Psychologists say that almost everything you learn is learned in the early years," says Pete. Perhaps he was already a proper native Aussie because he would go walkabout more than once in his life. The first time was when he turned his back on an established career in electrical engineering, with some of the big names in the industry at the time, GEC, Metro Vickers and BTH (British Thomson-Houston) on his CV, to sell records in a jazz store. He would later go for a wander out of his first marriage. First things first and the origins of his love of jazz. "I was about 12," he says. "It would be about 1936 and I was listening to band music. One day I heard Louis Armstrong and Duke Ellington. That struck and that was it. "The budding electrical engineer was in there too. "I had a wind-up record player but the arm was too heavy and it was wearing the records out," Pete recalls. "So I took the arm off and redesigned the record player with a different pick-up. "I'd save up my 6d (2.5p) weekly pocket money and every two months or so I could afford a 78. "It was six or eight weeks' saving for three minutes of music. I'd play them over and over." A favourite that stands out from his early years as a jazz fan was Louis Armstrong's Potato Head Blues, a tune which he still plays today. By the time he reached his late 20s, jazz turned from a hobby into a career. Pete quit electrical engineering to sell records for a jazz specialist in a Nottingham shop. "The pay was a pittance, but a nice chap ran it and I loved it," says Pete. He also had time to do some home-made hi-fi, but not much money for frills. His huge speaker was built directly into the fireplace, using the chimney as a sound box – he couldn't afford the wood for the back of a cabinet. The shop was successful, though, and Pete reckoned he could do likewise if he found the right location. He decided on Plymouth, a big enough centre to sustain a jazz record business, and sufficiently far away from the nearest competitor, in Bristol. He set up at the Stonehouse end of Union Street, no 93, with the simplest of names, The Record Shop. But the Devon city turned out to be a world away from jazz-loving Nottingham. "It was squaresville," smiles Pete. "The back of beyond. "It was a real struggle." That was despite the fact there were few rivals selling record in the city, the principal ones being Harborne Radio and Moon's. He survived thanks to hard work and his mail-order business, which he built up gradually. A partnership was one solution, reducing overheads. Through playing drums in a jazz band he met fellow musician Gordon Clarke ("to my embarrassment he was proper musician, a professional drummer") who ran a musical instruments and record shop, Clarke and Chinn. Pete shared premises near Drake Circus. 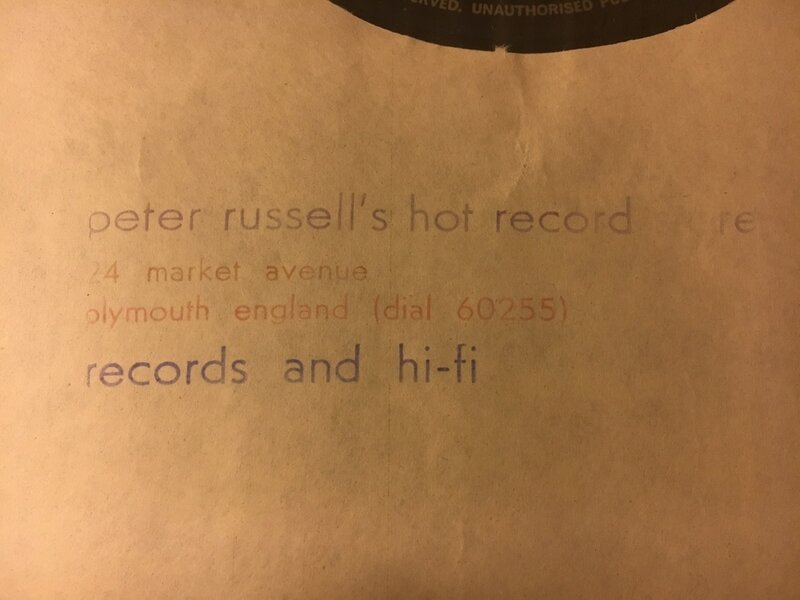 Then in the early 1960s he set up Pete Russell's Hot Records Store in Market Avenue, in a shop on the outside of the Pannier Market building. "We took over a butcher's shop and it took a heck of a lot of cleaning to get rid of the awful smell which I couldn't stand – I'm a vegetarian. "It wasn't much of a living," moans Pete, but he struggled on and branched out, selling equipment on which to play the recordings. "People used to say that the records didn't play very well and I realised why. This was a pre-historic city and many people still had wind-up players. So I started selling hi-fi, some separates with turntable, amp and speakers, and it built up from there. "I started another business, Pete Russell's Hi-Fi Attic in 1963 or 64." The business later got a separate home in New George Street, above Woolworths. By now there were changes in his personal life. His first wife was Sylvia, with whom he had had two sons, Guy and Ross, and twin daughters, Kim and Tanya. The arrival on the scene of an old flame, Betie, with whom Pete had a son, Quincy, led to friction in the Russell household. Sylvia and Pete parted company (and they remain on good terms today). Pete then moved in with Betie in Elliot Terrace on The Hoe – where she was still living with her husband, Mike, and children Debi, Sebi, and Crispin. "Some people were outraged," admits Pete, but adds: "but it was a very moral household." He and Betie were later married – and Mike managed his shop. They stayed together until Betie's death 15 years ago. Betie was heavily involved in the business, too. "I was busy with the mail order business in the office above the Market Avenue premises, and Betie was running the record shop below. "She said one day, 'People keep coming in and asking for the Beatles and Elvis, not the jazz that we're selling'. "I told her that they were rubbish and would never catch on! "I was worried we would be left with a lot of unsold stock. But Betie was right: she doubled the turnover in about two months. "In those days we didn't have much competition." But by the mid 1980s the boom times for the small independent record shops such as Pete's were coming to an end. "Virgin and HMV opened up next to us." So he sold the separate shop in 1987 and concentrated on selling records from the Hi-Fi attic premises. That continued until he sold the business in 1991. That is now 20 years ago – but Plymothians have not forgotten the man who filled their homes with music. "People still ask me in the street, 'can you get such and such record for me?'" Now aged 86, he fills his time supporting Breathe Easy (a network for asthma sufferers, part of the British Lung Foundation) and as an anti-nuclear campaigner (he is a prolific letter writer). He also enjoys birdwatching from the comfort of his own home on the outskirts of Plymouth and, of course, there is a lot of time to listen to jazz, which dominates his 4,000 albums. When we meet, a gentle jazz melody is breezing through the house. It's a Duke Ellington recording he has listened to countless times before, an echo of his earliest days as an enthusiast when he would play each precious new three minutes of shellac or vinyl over and over again. "Nowadays it's all digital downloads, isn't it?" says Pete. "They can download a hundred just like that," he adds, clicking his fingers, "but probably only ever listen to one of them properly." I spent most Saturday's hanging out in this shop and spent a lot of my money in it too. I still have many albums with the coveted sticker inside the sleeve. My first job at age 16 was in a print shop that printed the stickers which was weird. I remember once as a I was buying a progressive rock album, Peter was playing a bit of old jazz and asked me why I didn't feel the total excitement in this music, I said that I didn't but years later found what he was talking about as I discovered jazz. So sad to hear of Peter's passing. he was truly an inspiration to me. I spent countless hours in the shop in Union street listening to LPs that Pete decided were vital to my transition from "trad jazz" to the real thing. Of course i should have been in school ...but damn! ...where was I going to get an education like THAT? I've only been made aware of Pete's death. I was a regular mail order customer from 1962-1980ish and still have the entire set of his Good Noise catalogue. My particular passion was (and still is) the blues - many of my LPs still have the Pete Russell Hot Record Store' sticker on the back sleeve. I corresponded with him in December 2011 emailing him some of his letters to me of 1970. Here's one of the responses which is so "Pete Russell". RIP Pete. Wow, what have just appeared in my in-box are two messages you sent to Pete Knipe this morning. Well, I'm astonished, what a throw-back! I sold the record side of the business in 1987, and the hi-fi side in 1991 (when I got to be 65 and of pensionable age). And fancy anybody "digging out" copies of The Good Noise all these years later! Doesn't your area have a weekly rubbish collection? So, except that I still listen to jazz avidly and have quite a few recordings, as you might imagine, it's all faded to a distant memory, aided and abetted by my now having a very faded memory anyway. Of anything! In answer to the question in your last paragraph, I did make a hollow pretence at being a musician for some years (about a decade), until the pressure of running a shop made a harsh decision necessary. So with a distinct lack of talent there wasn't really much choice, and I gave up trying to be Ray Bauduc and opted for a more capitalist route to a "quiet" (?) life. In the end I sold the record side to Roy Oakshott who soon sold it on after landing a job with the BBC, which he still fulfils today with great talent and enthusiasm. And the day of the record shop is rapidly drawing to a close, I fear, when you can now download about 500 LPs/ CDs/ reel-to-reel tapes/ 45s/ cassettes/ and radio programmes onto a mobile phone and listen anywhere via headphones; but also take photographs, send e-mails, find where you are via G.P.S., search the net, or even, as a last resort, make phone calls. Not to mention downloading all the music you ever wanted and much that you didn't, from the internet. Next thing will be microchips containing all the music you might ever want to hear implanted in the brain - at birth, probably. Best wishes to a good customer, and glad to know you're still listening, Peter. Peter’s arrival in Plymouth in the 1950s was a turning point for those of us who were struggling to play Jazz. He had a major effect on the subsequent careers of musicians like myself, John Surman, Keith Rowe, Stan Willis, Ron Hills and many others. Peter’s Hot Record Store in Union Street became our Mecca. Though as impecunious students we were poor customers, he allowed us to listen to records for hours. He opened our ears to the new music coming out of the States at that time as well as to the rich history of Jazz. He never imposed his taste, but had subtle ways of making us aware of things we needed to hear. One day, either by accident, or more probably by design, as I went into the shop he had on the turntable Duke Ellington’s Blues in Orbit – one of the sounds than changed my life. We will never forget Peter, his kindness, his wry humour and the generosity with which he shared with us, and the Jazz world, his deep knowledge and love of the Good Noise. (Sept 29, 2014) Oldprogger said:Sad to hear of Peter's passing, but what a gentleman and what great memories. I still have the LPs and cassettes all bearing the little black and white sticker. Great times. (Sept 20, 2014) Guy said:RIP Pete, a life well lived! (Sept 7, 2014) Crispin Gill said:Sorry to say that Peter Russell (my step father) is close to to the end of his days. It's early September 2014 and Pete is in hospital with family close by, all the kind words are heart felt. (May 10, 2014) John Abraham said:Found this snippet of days past thoroughly enjoyed it. 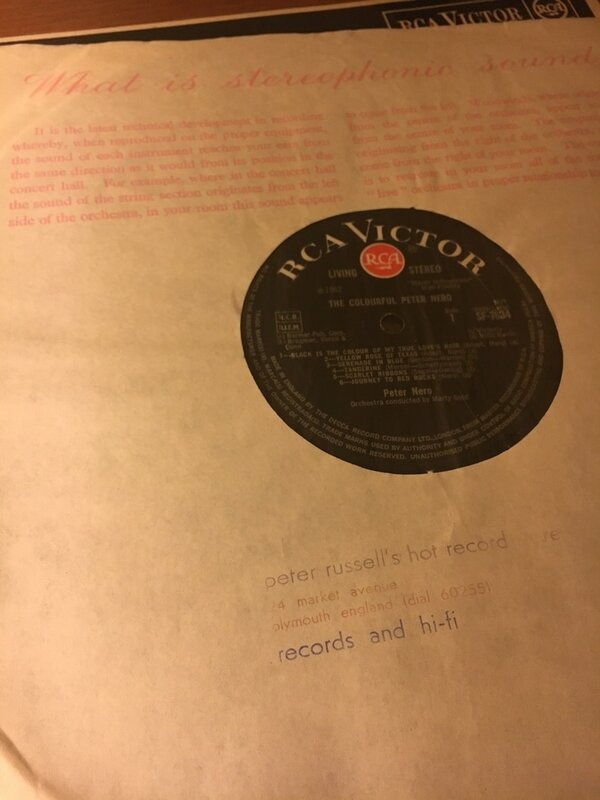 I have many records from Pete Russell. The one I will never forget hearing, when entering his pannier market shop, was The Mahavisnu Orchestral playing "Birds of Fire" . I bought it there that day and took it over to let my friends listen to it and one would not let me leave untill I sold it to him. I now have a good collection of John McLaughlin (leader of Mahavisnu Orchestra). Glad to here he is still going strong. pete sold me my first record -ep louis -mac the knife -soon 10 in w potatoe head etc then charlie parker memorial album- @ goodchilds- good start-can't stop!!! (Jan 28, 2013) Rog Rowe said:Most of my (extensive) vinyl collection were from Pete... my first being bought from the old premises in North Road... a Chuck Berry single. Most have the PRHRS sticker too. An education right from the beginning. (Jan 9, 2013) alan edmunds said:....just taken Elmore James for a spin, and noticed the 'Pete Russel's Hot Record Store' label, on the inside of the sleeve....so, thought I'd look him up....interesting article. How'yer doin' Pete! The passing of Chuck Berry yesterday made me think of Peter Russell. So sorry to hear of Peter's passing on reading this blog. I first met Peter in 1956 at Goodchilds Record Shop, 172 Arkwright Street in Nottingham, an area which has long since been redeveloped. I was just 13 and was very much into Boogie Woogie which went well with rock and roll. This developed into blues and modern jazz and I continued to buy records from Peter in the early 60s before leaving the UK to work abroad. Purchases included Freddy King Sings on King, Lightnin' Slim Rooster Blues on Excello and Chuck Berry's first LP After School Session on Chess, which was neve r issued in the UK. I still listen to LPs on 1960s hifi (SME/Thorens, Tannoys) and copy them to CD on a dedicated Toshiba CD recorder. I shall never forget Peter from those late 50s Nottingham days with his valuable advice and insights into jazz. Roy Knighton 19/3/17.